This blog has been rather lacking in posts about cake recently, so to remedy that, here are a few snaps from a little afternoon tea party I threw for my girls at the weekend. 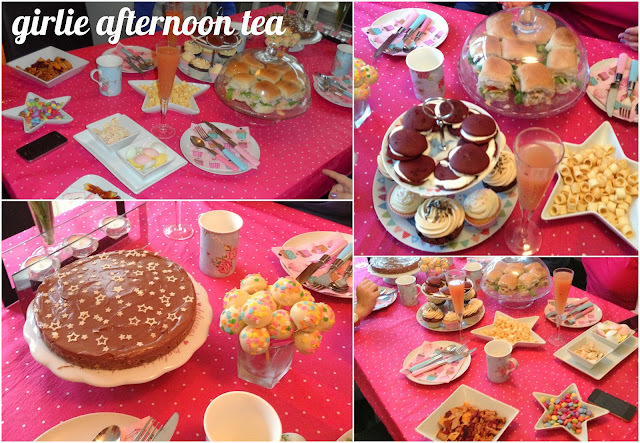 We had lots of scrummy cake, mini sandwiches, crisps and sweeties washed down with fruity prosecco and lots of cups of tea. This was my first time making whoopie pies - I think I made a few mistakes and they didn't turn out very neat, but I'll know what to do differently next time. I'll definitely have another go soon and then post the recipe and a step by step because they tasted amazing. I made some fairly standard cupcakes and cake pops, although I tried a new frosting for my chocolate cupcakes which was peanut butter! To make this I whipped together peanut butter, butter, icing sugar and double cream - naughty but oh so nice. This all looks amazing! I'd love to do something like this, baking is so much fun. I've wanted to try whoopie pies for ages so I can't wait for your step-by-step post. Can i steal you for Christmas? this looks delightfully scrummy! Oooh, saw the Nutella cheesecake on the TV! can't wait to see how you adapted it! This looks amazing, must have taken you forever!! Mmmm this post has made me so hungry! Oh my god, Nutella cheesecake? AMAZING!